By becoming a member of Doula UK, you support the work we do whilst receiving a number of benefits. 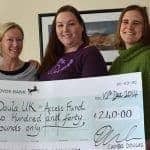 Members of Doula UK are by association also members of the European Doula Network, of which Doula UK is an active part. For more details of the different categories of membership, including what benefits they come with, please see the Membership Rates page. There are two routes to entry if you want to join Doula UK. Experienced doulas who have attended an initial preparation doula course which is not approved by Doula UK can apply to join Doula UK via Route B. Previous Doula UK members returning after time out from the membership. From this 1-2-1 we will mutually agree a plan of action for you to become a member of Doula UK – this may include some mentoring. Each application will be looked at on its own merit. Each doula who joins via Route B will have varying experience of being a doula and supporting women and their families. If you would like to discuss the requirements before completing an application please contact us. What is the cost of Route B? (This excludes the cost of any activity undertaken as part of the agreed action plan). Please email infrastructure@doula.org.uk if you wish to be considered for Route B entry.